Many elements of critique are involved in designing and ultimately building public swimming pools and spas. 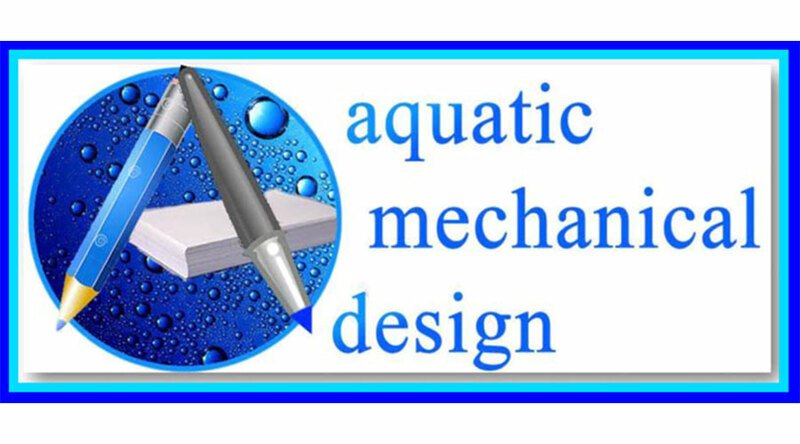 As an example, the pumping and filtration system of a commercial / public swimming pool and or spa must follow Environmental Health Department regulations and guidelines. Additionally, the Enclosures, Signage, ADA Handicap Guidelines and many other design elements must exhibit a smooth pathway for achieving compliance in order to affirm a well thought-out plan for action. 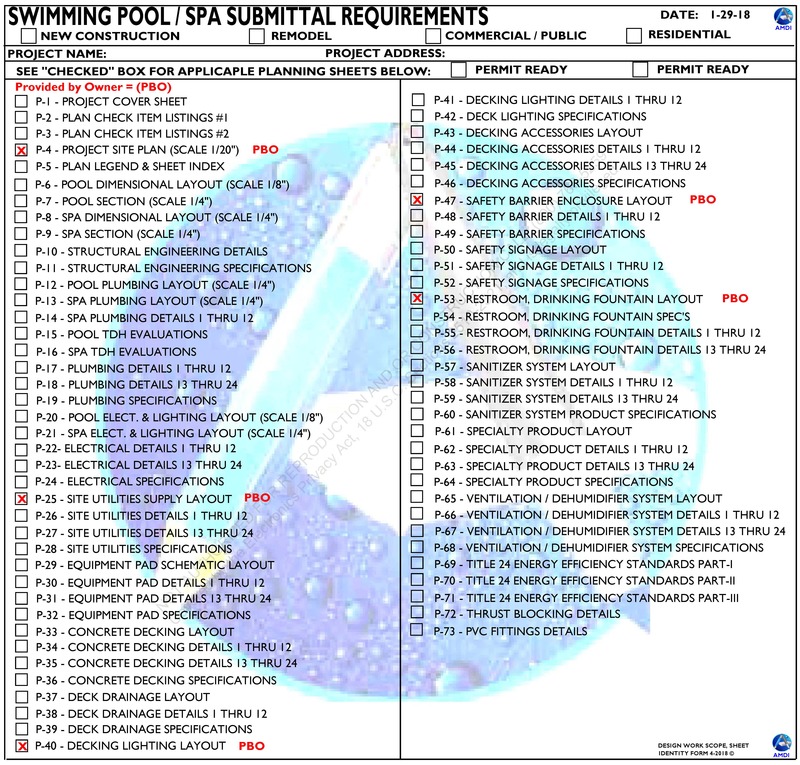 By viewing the image below you can gain greater insight for some of the planning sheet prerequisites that are necessary in producing a set of compliant commercial swimming pool plans and specifications. Just below, you can see an example of our P-1 Project Cover Sheet, which exhibits the Plan Sheet Index. This is the first page sheet that becomes one of a series of project planning sheets, all of which shall be organized in a fashion that aids explanations for the construction / installation intentions. The depth and breadth of planning preparations must accommodate the local guidelines for the Plan Checker’s jurisdictional over-viewing requirements, in order to become approved. Thus, the P-1 Project Cover Sheet, Plan Sheet Index below is exhibiting most all of the mandated informational sheets that can become part of a complete PLAN SET. NOTE: Not all P-Sheets listed below are required in all jurisdictions. In addition to accomplishing a well planned direction, plans must be able to be systematically executed in an efficient sequential production performance. One key element of success is producing “build-able plans” that can be effectively interpreted by skilled craftsmen and knowledgeable tradespeople. Understanding the assemblies and corresponding operational functionality is a critical component for arriving at the planned destination, a successful completion! USE THE WEB-FORM BELOW TO INDICATE THE DESIRED DEPTH IN OUR “P-SHEETS” PLANNING FOR YOUR PROJECT. AFTER RECEIVING YOUR COMPLETED WEB-FORM INQUIRY, WE WILL RESPOND WITH A DESIGN PROPOSAL. Please provide an image (jpg.file) that best describes the project's layout. Please upload a scaled PLOT PLAN with NORTH ARROW (jpg.file) that is showing the property line dimensions for the project. Check the boxes that best describes the P-Sheet elemental requirements for the design Work Scope intentions.